Counting Down the Days!!! 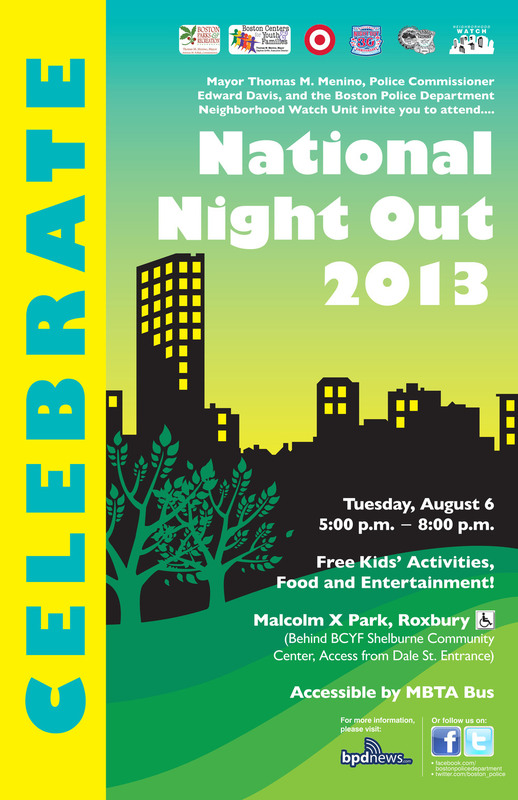 This year’s National Night Out Celebration – scheduled for August 6, 2013 – is only ONE day away!!! Mayor Tom Menino, Police Commissioner Ed Davis & the Boston Police Department Neighborhood Watch Unit cordially invite you to attend National Night Out 2013. This year’s National Night Out celebration – the 30th annual citywide celebration of partnerships between the police and community-based organizations – will be held at Malcolm X Park (behind BCYF Shelburne) from 5:00pm-8:00pm. There will be plenty of food, fun and entertainment for all who attend, especially the kids!! !